There’s another new subspecies of vacation, a “bikecation,” which offers tourists and locals alike first-hand, wheels-on-the-ground views of iconic city areas rarely glimpsed from a car or tour bus. The San Diego County Bicycle Coalition (SDCBC) and the city of San Diego’s Economic Development Department teamed up to present four-hour, six-to-seven-mile easy excursions of Downtown in a pilot project called Pedal, Play and Stay. Being held now through June, such tours start and finish at The Broadway Pier traveling to the Midway Museum, Seaport Village, Gaslamp District, East Village and Petco Park. The tour enlists bike-friendly hotels, restaurants and bars to draw tourists and staycationers to local businesses. It’s all part of an effort to bolster San Diego bicycle tourism. Most bike tourism falls under four main categories: Bicycle travel/touring, independently organized, long-distance bicycle tours; special events including organized rides, tours and races; destination riding centered around a particular destination or niche attraction; and urban cycling day tours of local/urban attractions. Bicycling is one of the fastest-growing types of outdoor recreation and tourism nationwide, with an estimated 48 million people bicycling recreationally annually, contributing $96.7 billion per year to the economy. To add excitement to its tour, Pedal, Plan and Stay stops at different local spots along the way to eat and drink, or visit landmarks like Petco Park’s Tony Gwynn statue. 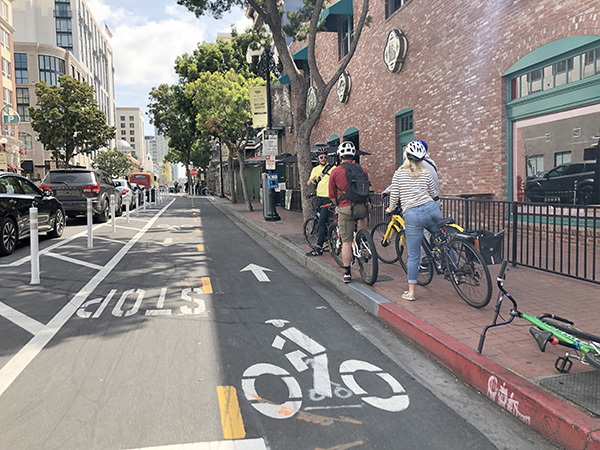 A recent small-group bikecation tour of Downtown was led by certified bicycling instructor Kevin Baross and RC Colon, SDCBC program coordinator. The pair explained why bike tourism is catching on. Every bike tour begins with the certified instructor discussing the “rules of the road.” Baross filled tour guests in on the problem-averting ABC’s of cycling. “A is for air,” Baross said noting different-size tires require different amounts of air marked on the tire. He noted skinnier tires means “less friction on the road which allows you to go faster but is harder on your body.” Conversely, he said larger tires with more traction slows speed but acts as a shock absorber for a smoother ride. “B is brakes,” continued Baross, noting the best way to check them is to move the bike and back and forth with one, and then both, hand brakes depressed. “The best way I know to stop a bike is to squeeze the front brake as hard as you can … but put your weight as far back on the bike as you can to keep you from moving forward,” he said. Baross warned that people should also check for loose water bottles that can drop off their bikes, or loose-fitting clothing that could get caught in the chain while riding. The certified instructor offered up his No. 1 rule of the road. Out on the road, Baross schooled his bicycling pupils on common-sense approaches to sharing the road with cars. Urging pupils to ride single file and together, Baross noted it’s best not to travel to the far right sight of the road, adding that prevents cars from making right-hand turns. Better to stick together as a group in the next lane over to the left, he said. On one-way streets, however, Baross noted it’s permissible to travel in the far-left lanes. He also warned riders to avoid the notoriously dangerous “open-door and startle zones” by keeping a safe distance away from cars parked along the curb. “It’s not hitting the (car) door that gets you, it’s the swerving into traffic unexpectedly that hits you,” Baross said of not paying attention to those cycling danger zones. The March 24 Pedal, Play and Stay tour stopped off at The Social Tap at 815 J St. where chef Jake Snyder discussed the pub’s background. During lunch at Social Tap, discussing the future of bike tourism in San Diego, Baross said, “What San Diego scores highest in is potential.” He added San Diego is increasingly putting in more separated bike lanes, like the ones being used now Downtown by Pedal, Plan and Stay. Baross noted separated lanes make cyclists feel safer, encouraging more people to use bicycles as one of their traveling modes. “We’re [bike coalition] not anti-car,” Baross said. “People shouldn’t be forced to use one travel mode over another. It’s best for them to have as many options as possible. “That could mean putting your bike on a bus, or rolling it onto a trolley. Or it could mean putting it in the back of your car and driving halfway to your destination, then taking it out and riding the rest of the way to work and telling everybody you road all the way,” added Baross. For more information, visit sdbikecoalition.org/tours. April 5 — 11 a.m.
April 26 — 11 a.m.
April 28 — 1 p.m.
May 3 — 11 a.m.
May 17 — 11 a.m.
May 31 — 11 a.m.
June 7 — 11 a.m.
June 8 — 11 a.m.